Direct Satellite TV: How to Enjoy Free-time Leisure Watching Free Channels? A direct satellite TV is a well-connected, installed and configured television with a satellite dish and a satellite receiver. So, how to connect, install, configure and program your satellite TV dish and receiver to enjoy your leisure time with free TVs? You may know that there are so many direct television channels, wether those channels work through cable TV you pay for every month, or satellite TV you watch free. This page, however, is about how to work with direct television satellites to enjoy your leisure with free TVs. The direct satellite TV is a continuation from Direct TV Satellite, where you read about the menu operation. Other TV satellite pages get you through Streaming Satellite TV to watch Free Satellite TV channels. This happens through some complete manuals on those connected pages to work with your satellite TV equipments to connect, configure, install and program your Dish Satellite TV. This is the process you need to work with your Digital Satellite TV to capture many Satellite TV Channels and Direct TV Channels through your dish satellite TV and program many Dish TV Channels getting through streaming satellite TV to watch satellite TV. That means the well-explained process on the given pages enables you to watch thousands of satellite television channels totally free. Here we continue the remaining of the process you already read on the given pages above. If you didn't follow them, begin from the first page and then continue on direct satellite TV. 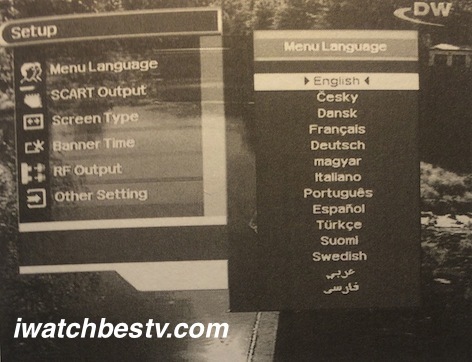 Direct Satellite Television: Displaying The Main Menu Language Setting on Screen. The Menu Language in Your Direct Satellite TV! Read the content of the displayed main menu you learned to display on your screen. You will want to get to the Setup in the main menu, which has more than five functions including the setting of the menu language. You will see many language there. You may see that there are fourteen languages available including Arabic, Czech, Danish, English (at the top), Farsi, French, Finnish, German, Hungarian, Italian, Portuguese, Spanish, Swedish and Trukish. So, select your language from the right display on this screen. Select the Setup in the Main Menu. Use the right button to select the Menu Language. Use the UP / DOWN buttons to select the language your language. The direct satellite TV instructions continue below. 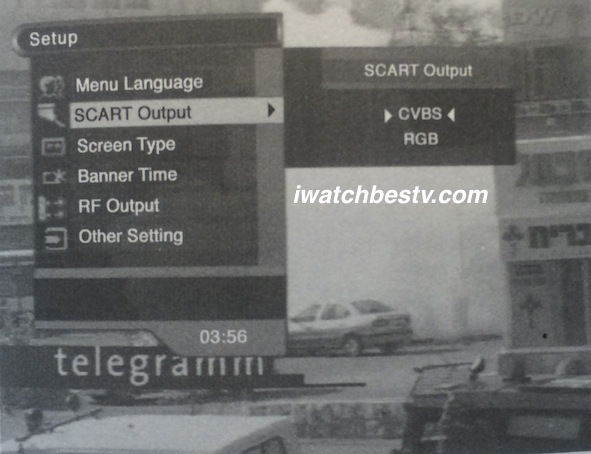 Direct Satellite Television: Displaying The SCART Output on the Main Menu on Screen. The SCART Output of Your Direct Satellite TV! The SCART output is an important device you need for the direct satellite TV to function. If anything is wrong with the cable, or the connection of the SCART, then you will not see any picture on your television. You will see the SCART Output highlighted on the setup menu to drop a small window at the right for it with the output mode CVBS and RGP. The SCART is the abbreviation from the French terms of syndicate or increase, construct, device, radio receiver and television receiver. It is also the standard connection used through this card and similar cables to transmit audio and picture through a receiver to a television. Along with the screen type and the process you have carried to install channels, the SCART also feeds your television and video by good pictures. You actually use it by connecting it from the satellite receiver, or from the video to the television. The CVBS, as an analog satellite receiver transmission and video transmission is an abbreviation, which stands for composite video broadcast signal and sometimes composite video blanking sync, or composite video burst sync. The RGB is the color mode or color system composed of red, green, and blue. But, as component in the SCART it transmit those colors to the television with color diagrammatic produced from the mixture of those colors, which results slightly in good different colors. Direct Satellite Television: Displaying The Screen Type on the Main Menu on Screen. 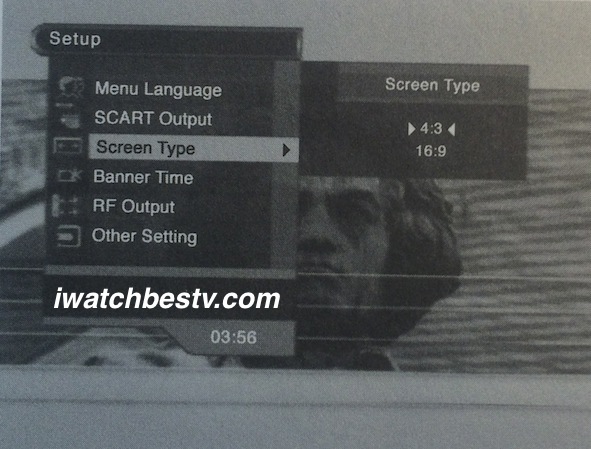 The Screen Type of Your Direct Satellite TV! The screen type window on the main menu display depends on your TV type. The window suggests only two types to use. So, you could choose either "4:3", or 16:9". But, you should know something about this issue, as all TV screens come in different sizes in inches. We all know this even from the classical televisions we had long time ago. The type is different from the size, although sometimes it indicates the size from with the type itself. You will see that there are other screen type which are not included in this screen, such as "14:9" and "2:35". This preference is used now even in Android, other smartphones and tablets to enhance the performance of the screens and the viewing experiences of the users. This helps the picture to be fine depending on the setup process of your TV screen picture. But, enhancing pictures on your satellite TV should be actually done through the channels installation, while capturing and configuring your satellite TV. When you get the channels displaying on the screen during the satellite TV channels installation, you see the clarity of the picture and when it is not clear, you direct the dish to enable your direct satellite TV to capture the best picture. So, on the setup menu, you will read Menu Language, SCAR Output, Screen Type (highlighted to bring the format 4:3 and 16:9 on another small dropping right menu), Banner Time, RF Output and Other Setting. 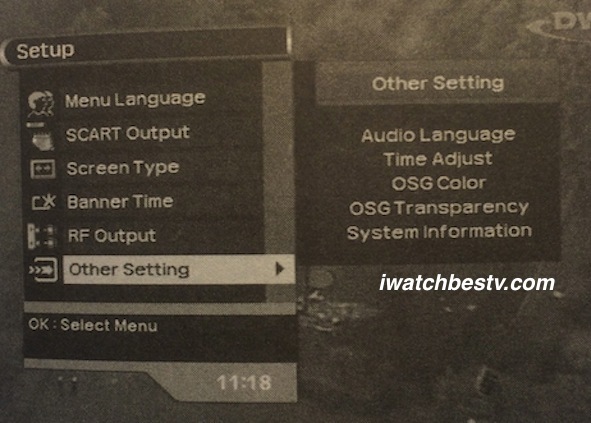 Direct Satellite Television: Displaying The Other Setting on the Main Menu on Screen. The Other Setting of Your Direct Satellite TV! What remains on this screen is the Other Setting, which you could use to do other things. When you click on it it becomes highlighted on the screen to open a small menu through which you read Auto Language, Time Adjust, OSG Color, OSG Transparency and System Information. The open scene graph (OSG) color works with TV satellites, as well as cameras, films, videos and other arts including even texture you use with colors. It has also the setting capacity to make objects transparent. So, there is an OSG transparency on the screen. You can experiment with them to see the effects. With the RGB it seems like a system that matches colors throughout your satellite TV equipments to reflect on your screen. Continue at Satellite Direct TV, when you complete direct satellite TV to express your love and say thank you for those useful pages. Say thank you through the comment form below, but writing good impression about this page, or writing about your favorite TV movie, programs, shows, or series. Share the direct satellite TV with your socials and the other services you see on the small buttons. Read the update of tvcinemaapp.com/i-watch-best-tv-blog.html through your services using the small buttons at the top left, or at the bottom. Take the survey you see below the comment form.